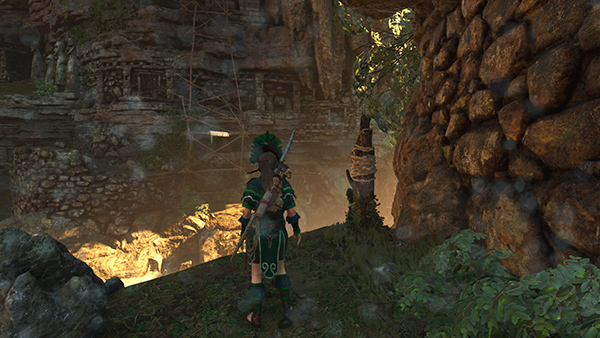 When you first arrive in this area on the way to rescue Unuratu, the guards near the wooden bridge outside the Temple of Kukulkan tell Lara that no one is allowed to enter the prison. So you'll need to find another way to Unuratu. 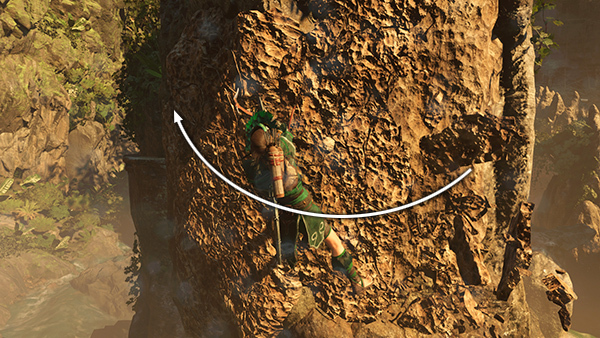 This same path will take you to the THIRD CRYPT ENTRANCE and allow you to complete the DUNKIN' BONES CHALLENGE. 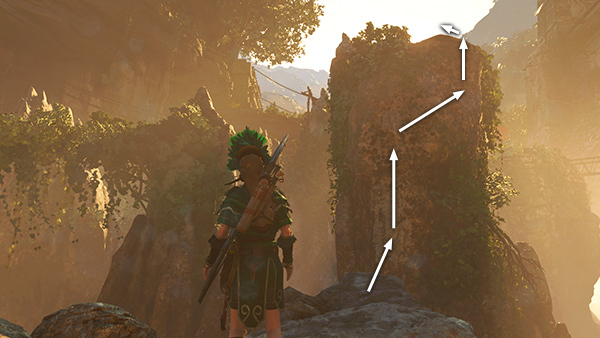 Head to the left (north). 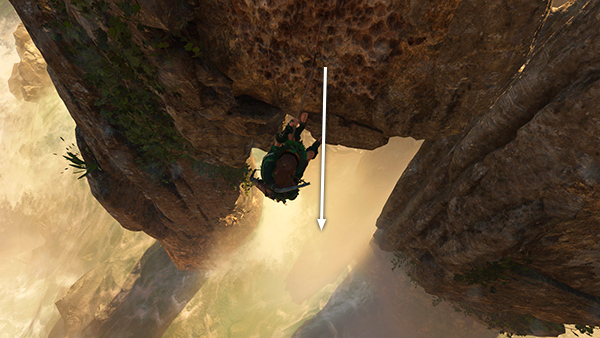 ...until you reach a narrow handhold. 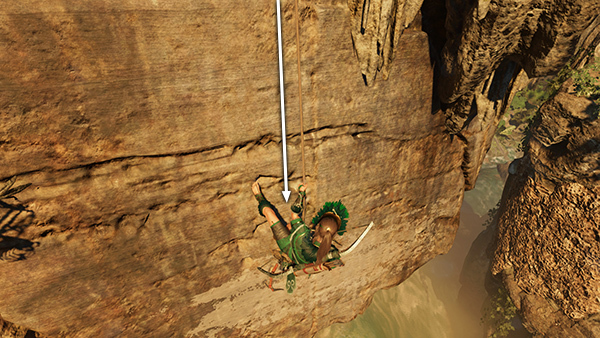 Climb to the right until Lara is hanging in front of another climbable area. ...initiating the Dunkin' Bones Challenge. 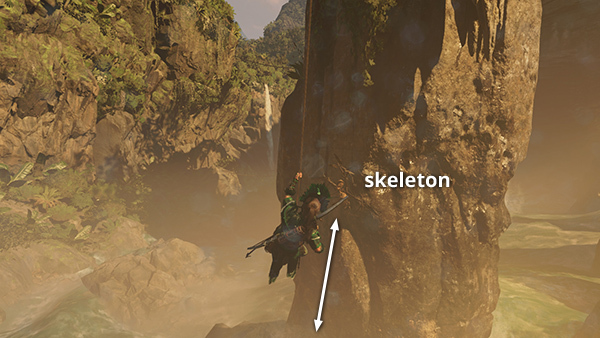 You'll need to knock down 2 more skeletons to complete the challenge. Both can be found on the way to the prison. 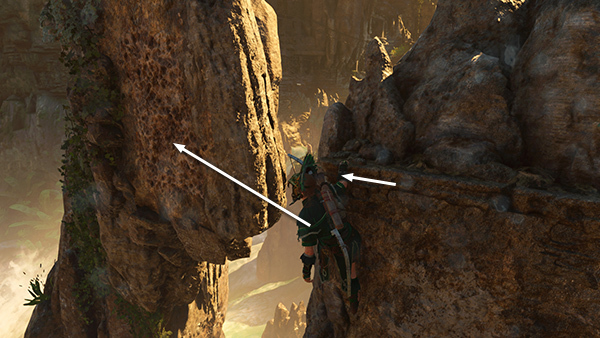 Their locations are marked with pink dots on the annotated level map. 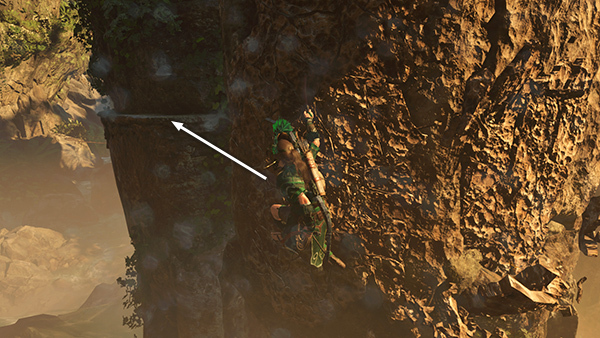 Now rappel down a little farther, wall run back and forth to build momentum, and jump over to the climbable area on the stone column to the right. 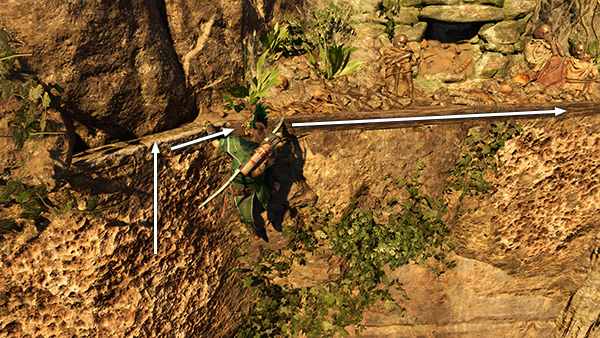 ...and jump across the gap to grab the narrow ledge on the next column to the left. Once you reach this handhold, you can take your time. Then scramble up the wall to grab a handhold at the top of the column. 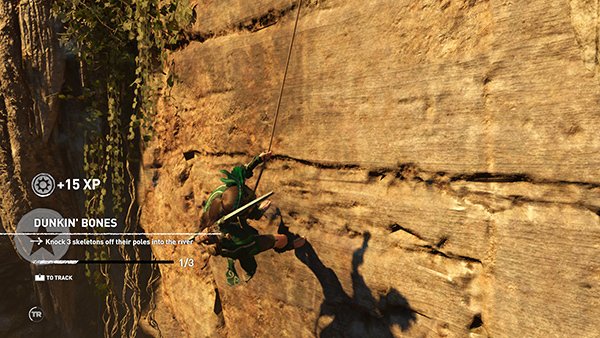 Climb then jump to the left to latch onto the climbable surface on the next column. 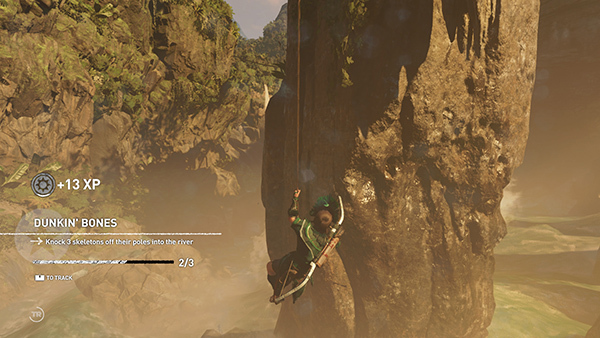 Rappel down into the gap between the two columns, so Lara is dangling above the rushing river. The next skeleton (2/3) for the challenge is hanging from the column on the left. 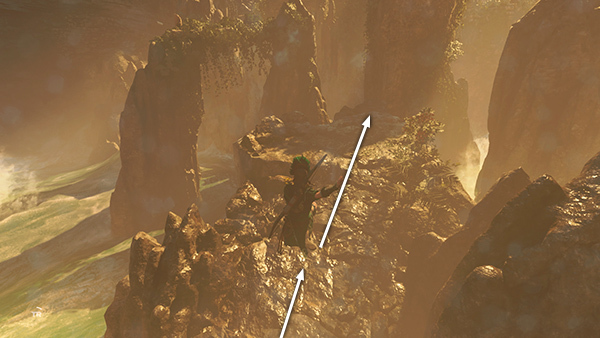 Use the mouse or right stick to move the camera around to the right so it's pointing at the skeleton, rather than the path ahead. Then swing back and forth to knock the skeleton down. Move the camera back around to the left so it's pointing between the two columns. 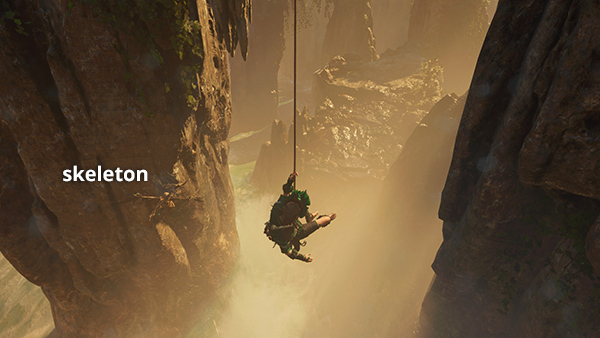 Swing back and forth to build momentum, then jump onto the rocky island ahead. Move to the top end of the island. 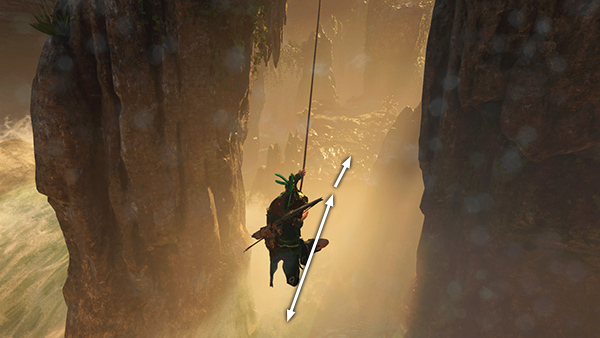 Jump from the jutting ledge toward the next stone column. 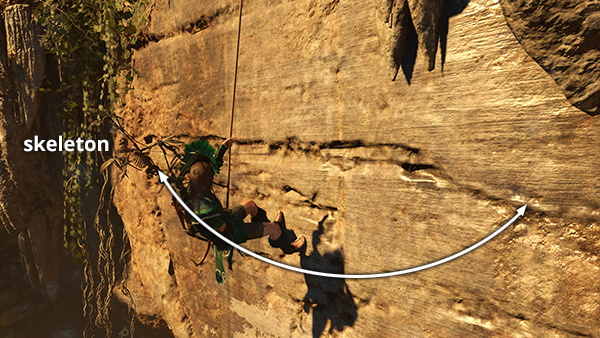 Scramble up the smooth wall and latch onto the climbable rock above. 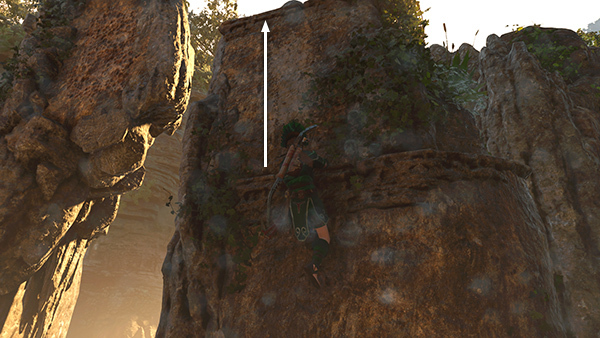 Continue climbing up and around to the right onto top of the column. 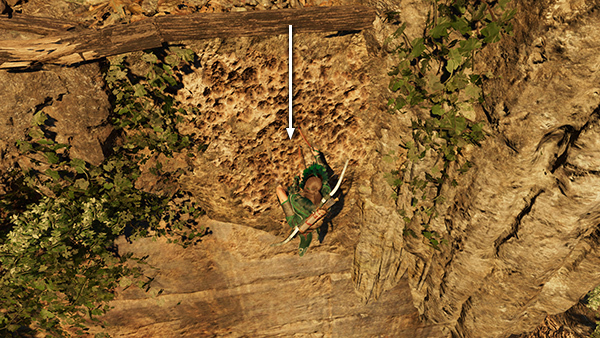 ...but Lara is able to grab the horizontal ledge below the windows. 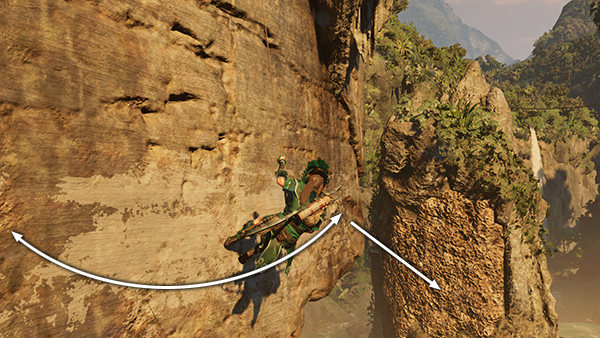 Climb/jump along the ledge to the left. 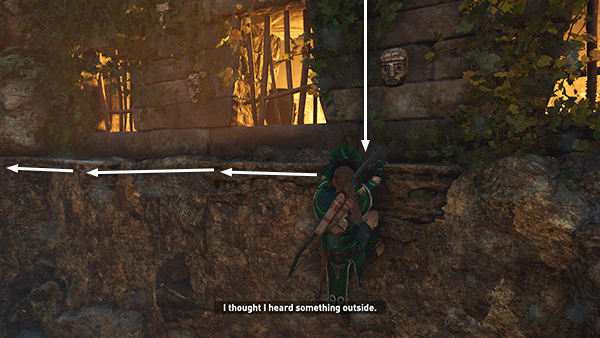 NOTE: As you pass by the guard room windows, a nearby monolith will be marked on your map. 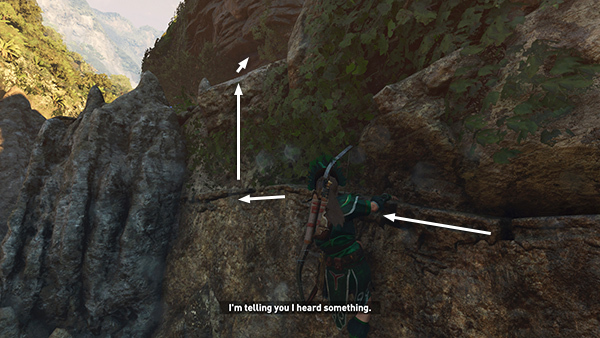 You can't reach it from here, but we'll get to it soon. 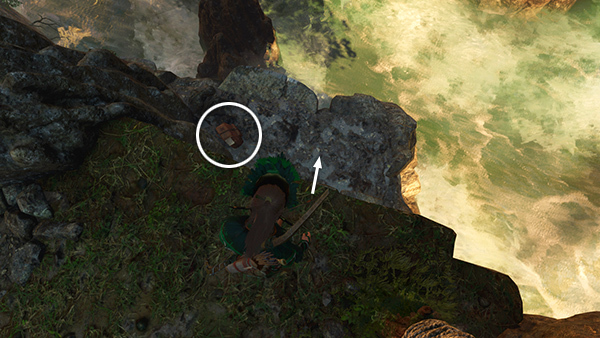 Then scramble up onto the ledge above. 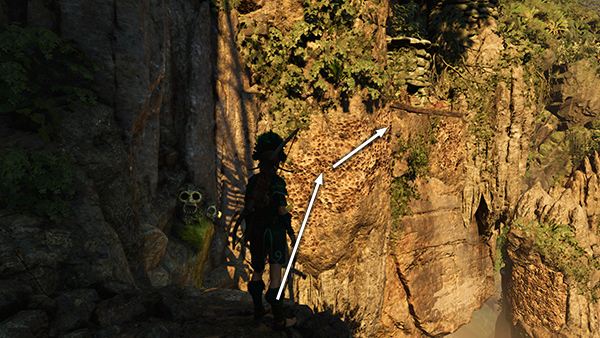 ...and drop down onto the ledge below to find an explorer backpack (5/6). 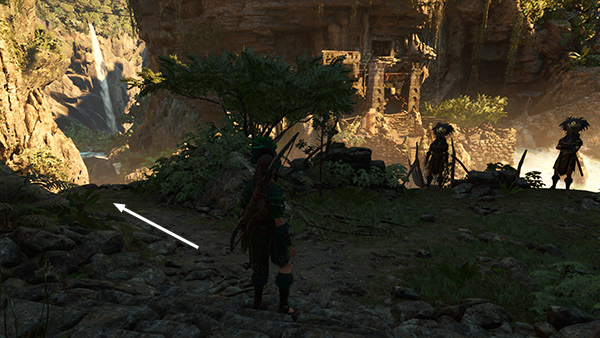 Examining it reveals the location of 2 nearby crypts, as well as several survival caches. 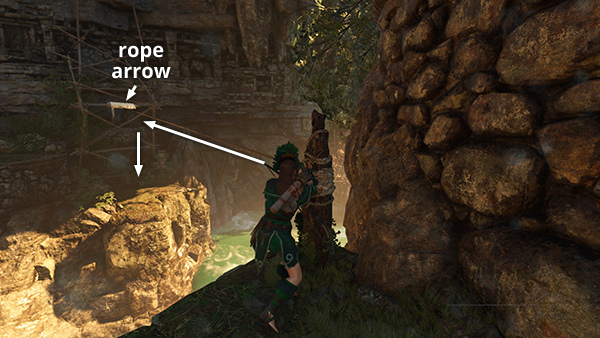 Climb back up and stand near the rope-wrapped post. 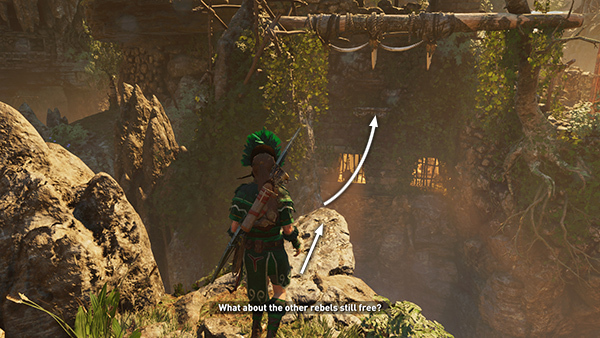 Shoot a rope arrow into the beam on the other side of the river then climb across. 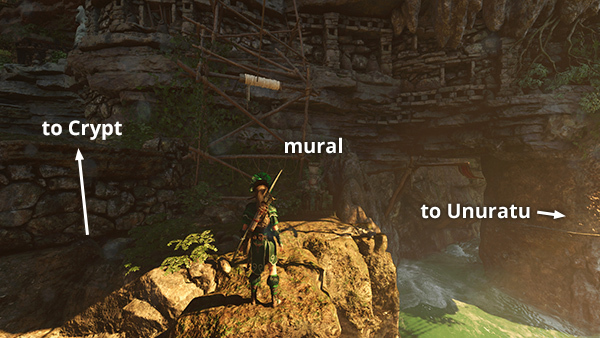 There's a mural (18/23), The Winged Serpent (Yucatec/Pantheon of Gods), just below where you anchored the rope line. 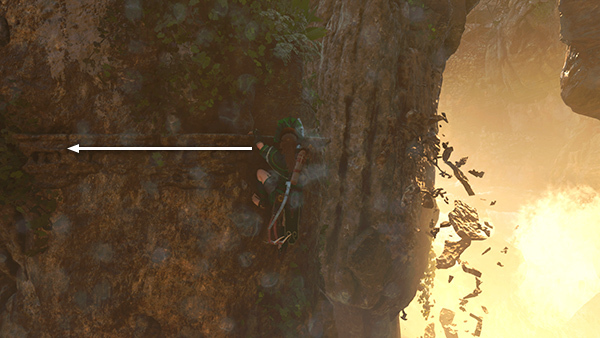 You can now take a slight detour to raid a Crypt or continue with the rescue operation. 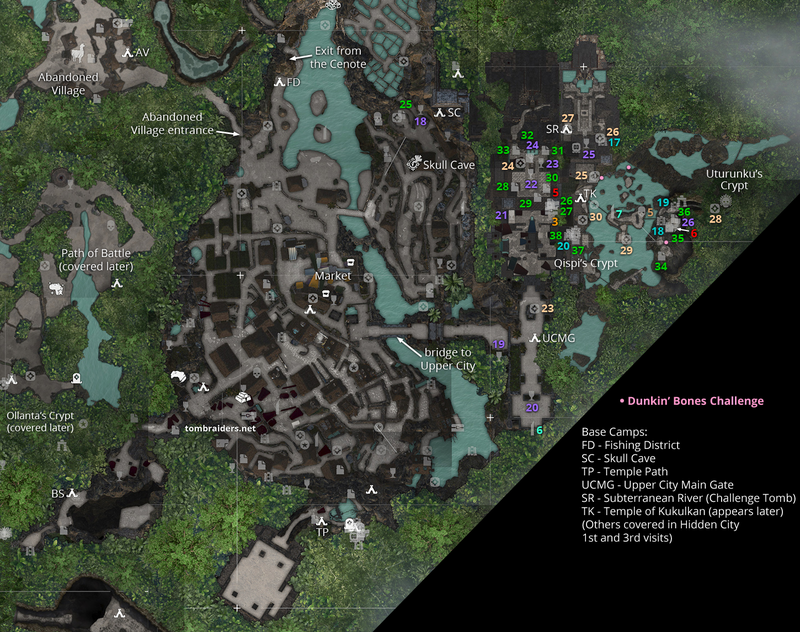 Follow this link for the separate THIRD HIDDEN CITY CRYPT WALKTHROUGH. Or, click "Next" below to follow the plot.